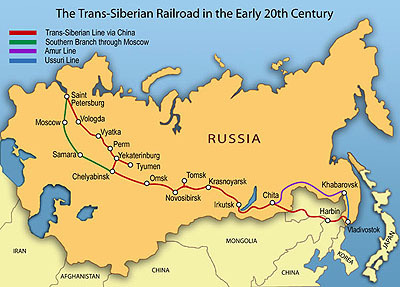 Looking closely at this map, you can see a small problem with the route of the Trans-Siberian Railway; a sizable portion of it runs through non-Russian territory. Not sure how Russia ever thought that it was going to get away with that, and it didn't (war with Japan soon followed). Charles Conant, Russia as a World Power, from The North American Review, 168 (February 1899). Some interesting comments by contemporaries about Witte. Excerpts from his memoirs focusing on tariffs and the imperial court (There is also a short biography on the latter website.). There are numerous online encyclopedia entries for Witte, and there is a good essay, From Vision to Reality, dealing with Witte's program of railway construction in Russia. Citing specific evidence from the information about Witte, what were some of the main ideas of Witte's economic policy for Russia? Your paragraph should be about one-half page in length, double-spaced with one-inch margins, font size 10 or 12; it should contain a concise topic sentence that directly responds to the assigned question (no need to define terms or cite a dictionary) and use direct, quoted material to support your points. You may consider submitting a draft of your assignment to your instructor for feedback before submitting the assignment for a grade. Please send some specific questions that you would like answered about your draft. The questions can be general (Is my thesis/first sentence clear?) or specific (Is the phrase, "Chardin was jeweller," written correctly?). Your assignment should be sent to your course instructor following the directions for submitting assignments. Please take a moment to review Charlie's History Writing Center for specific information on the writing requirements for the assignments in the course.